Your police or fire department has decided it wants more lights for its fleet vehicles. How do you, the aquisition officer, decide which lights to select when there are so many types of emergency vehicle lights available on the market? There are light bars, traffic advisors, surface mount lights, interior lights such as visor lights and deck and dash lights, and headlight and taillight flashers, and more. Yes, there are a lot of choices. But...Don’t worry! Extreme Tactical Dynamics has them ALL! So...Let’s get started. First: Consider the type of vehicle. Is it a patrol car or pursuit vehicle? Is it used for undercover work or is it a K-9 carrying unit? Is it a large SUV or pick-up or a liaison vehicle? Second: Do you want the lights mounted permanently or does the department want to be able to move the lights the from vehicle to vehicle, using the new acquisitions to the maximum degree? Third: Where are the new emergency lights to be mounted? If you want a 360° circle of high intensity flashing light from the roof of your vehicle, think light bar. If you don’t want the lights to be seen, there are Hideaways. Fourth: How much does the department want to invest in new emergency light setups? ETD has a wide, wide range of products, all at the best prices around. You’ll find the right light that fits your budget among our many products. Just start browsing! When civilians think of a cop car, they most often picture a patrol car, often referred to as cruisers. These are the most common type of police vehicle on the streets. Patrol cars are mainly used to transport officers, whether it’s on simple patrol or rushing them to an accident scene. 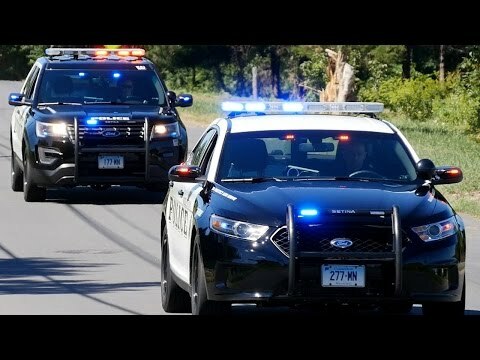 They are outfitted with the most common types of police lights and audible equipment including a light bar, surface mount lights, interior lights, a siren, and siren speakers. If the cruisers in the fleet are ‘underlit’, you might want to add one or more of these types of lights. Police traffic cars, road policing units, are very similar to patrol cars, but always have traffic advisors as part of their emergency light gear. Traffic directors can be permanently or temporarily mounted on the roof, be part of visor lights like the Commander Series, or can flash amber lights from interior dash and deck systems. Traffic Advisor Light systems send light messages that warn motorists to slow down, alert them to be prepared to stop, and direct them to change lanes. In addition to traffic directing lights, additional audible equipment, specialty bumpers, and advanced radar and laser speed detection units are usually part of the police emergency equipment package. Police traffic vehicles also usually carry orange cones, traffic control signs, and a flare gun in the trunk that can be used in case of an emergencies. SUVs and Pickups are made to go OFF-Road, so in addition to regular emergency lights, ETD offers a wide range of Off-Road Light Bars which have both spots and wide angle lighting. Individual spots and expansive lights are available, too, that are mounted high and shine far and wide. Working at night is hazardous enough, but when pursuing a person or vehicle into rough terrain at night, you want lighting equipment that is up to the job. Always, consider where a police officer or firefighter might have to drive the vehicle at night when choosing lights to equip SUVs and trucks. K-9 Units are sometimes modified patrol cars, so most often are outfitted as a common cruiser would be except decals indicating a dog is on board are stuck on the vehicle. There are no additional lights mounted because a K-9 is present. When emergency vehicles are used for multi-purposes, including undercover work, adding temporary lights is the best choice. 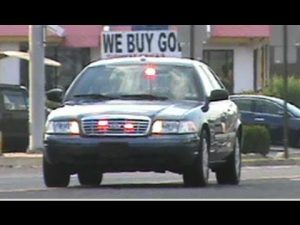 Small and medium sized light bars are attached to any exterior flat surface with four strong magnets once a vehicle comes to a stop. Pull-down visor lights are attached with especially made clips, and dash and deck lights are mounted with suction cups connected to brackets. Small Hideaway Lights are a good choice, too, because they go unnoticed on the surface of the vehicle, blending well with manufacturer’s lights or are hidden in the headlights or taillights. Keeping in mind the purpose of the lights is all important when making the decision when adding more lights to any vehicle. Of course, there is the consideration of cost and mounting options as well. But no matter what your needs are, there is no doubt that Extreme Tactical Dynamics has the light you are looking for. If you have any questions about which light is best for your fleet vehicle or POV, just call our customer service department. We are always ready to help you find just what you are looking for!